Thinking of a new you but can’t find the time for the gym or don’t want to commit to a monthly gym membership fee? Well don’t worry; you can still keep in shape without leaving the house! Forget about hours on the treadmill – research shows that short, intense ‘interval training’ is a great way to boost fat loss and fitness. All you need is a little bit of space and a stop watch! Why not try this simple workout that can be performed with just a pair of trainers or on an exercise bike. Warm-up by jogging on the spot and stretching. Once you’re warm, sprint maximally on the spot for 10 seconds. Walk or jog for 30 seconds to 1 minute, repeat. Try starting with a total of 5 minutes, gradually building up to 15 minutes as your fitness improves. Here’s a fat loss and fitness tip that doesn’t require any exercise but can dramatically improve your results; keep a training log. The key to losing more fat and getting fitter is to progress the intensity of your home workouts (shorter rest periods, more repetitions, more resistance). This has a dramatic effect on your body. Get yourself a diary, or pin a workout log on the fridge to track your progress. One of the benefits of going to a health club is the little luxuries like ice cool water fountains and TV screens, however, working out at home shouldn’t be dull. To turn your gym time into a sanctuary, make sure your workout space is nice and clean, your water is chilled and you have uplifiting music at the ready. Move between exercises with as little rest as possible; perform 2-4 circuits. Adding a small amount of weight to your squats, lunges and other exercises will lift your calorie burn both during and after exercise, enhancing your body tone and shape. Dumbbells (or fitness bands) are excellent, inexpensive solutions that enable you to perform a range of new exercises in the comfort of your own home. When you combine cardio and weight training with a well balanced diet and nutrition plan you can get even faster results, including the Maxitone range to help you achieve your goals quickly. Whether your goal is Weight Loss or Toning, Maxitone can help to make your workouts count. 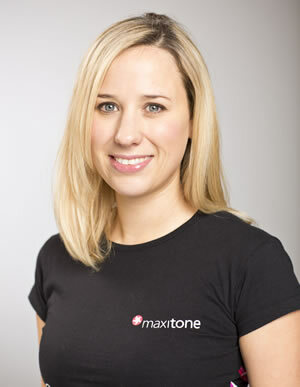 Registered Dietitian for Maxitone, and keen marathon runner! This entry was posted in Talking Ocado and tagged Dietitian, fat loss, Get fit by Ocado. Bookmark the permalink.